You have to remember, I’m just beginning my journey into third wave coffee. So bear with me as I share my discoveries. I only began drinking specialty coffee on a regular basis since the beginning of the year. I’m not a aficianado, but my knowledge is growing by the day. I have credited a few friends in previous posts for that, but Instagram is largely responsible for my development as well. Instagram is a hotbed for coffee photography and fandom. In fact I connect with many enthusiasts, coffee roasters and shops via Instagram posts of my home brew efforts. In fact I was lucky enough to win a bag from KC Coffee Geek, Steve, when he ran an Instagram contest. He is a great source of information for all things coffee related and has recently began curating a subscription service. This is a great way to sample great coffee if you are new to specialty coffee. Now Steve went a step further with my Instagram prize and sent me not one, but two bags of coffee. I was blown away. The local bag he sent me was a Konga Natural from PT’s Coffee. This was my first natural coffee and I was super excited. Quick lesson: most coffees are considered washed that means that the bean is removed from the fruit and is then washed and dried prior to roasting, whereas naturals are dried in the fruit giving it a whole other level of taste and flavor. The cherry flavor out of this coffee was unreal and incredibly delicious. The other bag Steve sent me came from Bean Fruit based in Mississippi. This was another Ethiopian coffee that Steve threw in so I could compare the two. Both are from the same region, but Bean Fruit is washed. They both made excellent cups of coffee and it was really cool to compare the differences in flavor profiles. 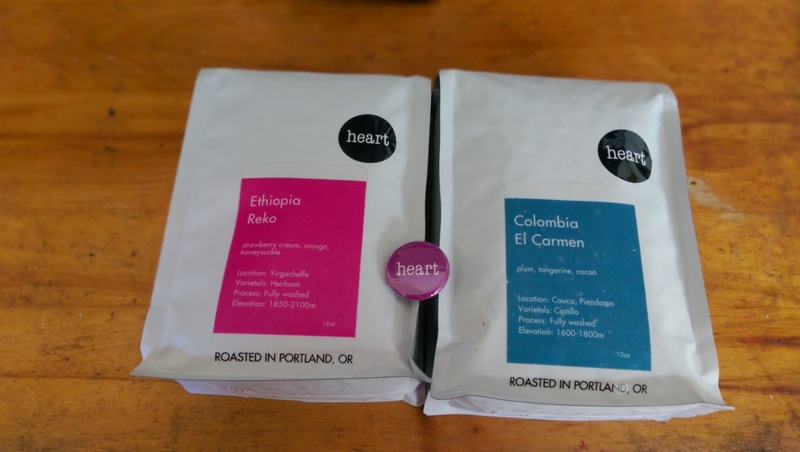 The next great roaster you need to try is Heart of Portland, Oregon. I received two bags as a belated birthday present and they were drastically different ends of the spectrum. I loved the Ethiopia Reko, it was the lightest and most fruit forward coffee I had tasted at that point in specialty coffee. Now coming from a Starbucks mindset this was a drastic about face. Some may write it off as weak, but really this is where the thinking needs to change. The Colombian was more of a middle grounds and I had mixed feeling about that bag in the end. I honestly think I wasted the bag due to my struggles with the v60 brew method more than anything else. I may need to revisit the bag now that I have vastly improved my technique. Many of us so often add flavoring and cream to our coffee that we really mask or hide the true flavors of the roast. In fact you might even argue Starbucks’ business model is based off masking their roast in order to sell more expensive drinks. Specialty coffee really invites you to taste all the flavor of the roast from its acidity to its bitterness, much like wine tasting. They want you to experience the coffee. I will try to keep you updated as I explore more coffee. If you have any questions on the topic feel free to drop them below in the comments section. Previous Post Meerkat or Periscope?